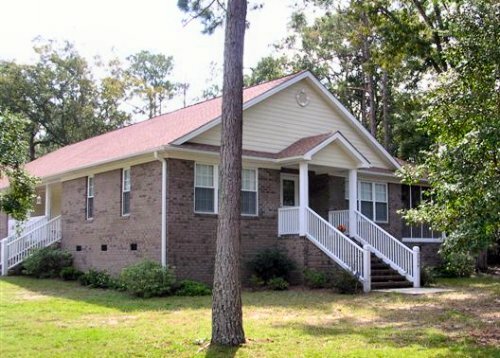 Single Story Home Under 2500 Sq.Ft.-JMV000506-Carolina Coastal Designs, Inc. 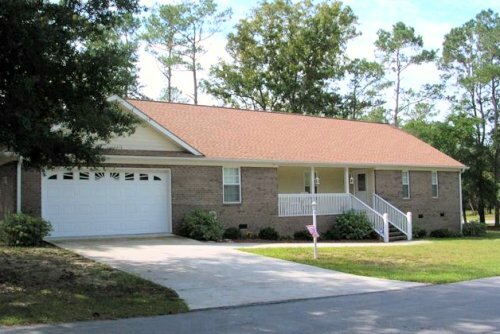 This well laid out 3-bedroom ranch, designed to take advantage of its corner lot by having two front entrances, is located in River Run Plantation in North Carolina. An open floor plan is utilized to maximize the core living areas of this home. A dramatically vaulted ceiling tops the great room, modern kitchen and dining areas. The great room opens directly to a covered porch and has a cozy gas fireplace. The dining area opens to a screened porch for outdoor enjoyment. The master bedroom suite has a large private bath with a spa tub and spacious walk-in closet. 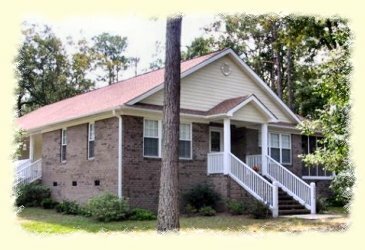 Two additional bedrooms and a full bath along with a utility room complete this floor plan. Plentiful storage is provided adjacent to the 2-car garage.